Guyanese got a saying, when dem seh a man is a two-edged sword, dem mean dat he can swing both ways. And by swinging both ways dem don’t mean playing male and fe male at de same time. Dat is why Guyanese does prefer to seh a man is a Dutch axe. Yet being a Dutch axe is swinging both ways almost at de same time. Suh dem boys prefer to seh a man is two-mouth. Is when dem was dealing wid Rusal, dem find out Guyanese really two-face and two mouth at de same time. A man name Akeel use to be de Chief Labour Officer. When anybody got problems wid dem boss, he use to get involve. Nine out of ten times, he use to rule gainst de boss. He even had cause to rule gainst Rusal. De odda day, dem boys ketch Rusal at odds wid de workers. 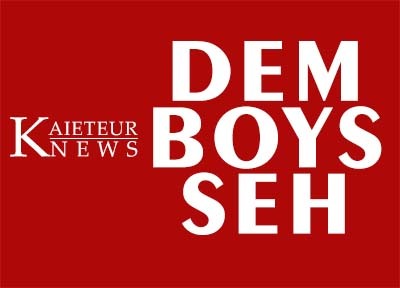 Nearly 90 of de workers get knock off and dem run to de Labour Ministry. De Ministry notice dat Rusal didn’t have union recognition; suh it had to be hard talking and nuff bluff. As soon as de Labour Ministry and Rusal meet, dem boys notice Akeel sitting down wid Rusal. He jump from Labour to Rusal. Dat wasn’t all. De wuk he use to do fuh Labour, he doing fuh Rusal; suh he always got de opposite position from de one he use to have. If he use to tell de workers to strike, now he telling dem to go back to work. De union don’t want nutten to do wid him. Dem boys notice de same thing in politics. When a man deh in one position he does do one thing, like when people call dem pun de phone dem never got time. But when dem deh out of office dem got all de time in de world to meet and greet people. Dem is de people who dies sit down in office and don’t talk to nobody but as soon as election time come, dem walking about shaking people hands and kissing babies. Talk half and watch out wid dem two mouth people.